Chadamla was worried that his marriage was falling apart. He was beating his wife several times a month, and he couldn’t seem to stop. India has a population of about 1.3 billion people. The Adventist Church has a membership of almost 1.6 million. This represents slightly more than one Adventist for every 870 people. Much of the church’s membership growth has occurred in the past 25 years, thanks to the help of Adventist schools and lay evangelism efforts. The Southern Asia Division has had no place in which to hold large division-wide meetings except conference centers and hotels, which can be prohibitively expensive. Part of this quarter’s Thirteenth Sabbath Offering will help complete a training center and conference center in central India that will serve the entire subcontinent of Southern Asia. To Sabbath School teachers: This story is for Sabbath, July 8. Chadamla (pronounced: chah-DAHM-lah) stopped outside the Seventh-day Adventist church in his town on a Sabbath morning. His life was not going well. He made good money driving a three-wheeled taxi. But he was worried that his marriage was falling apart. He was beating his wife several times a month, and he couldn’t seem to stop. He heard the pastor’s voice from inside the church and stopped to listen. The pastor was telling the Sabbath School class about Jacob. He described a ladder of angels stretching into the sky and told of Jacob’s pledge to give 10 percent of his income to the Lord in exchange for blessings. After the Sabbath School class ended, Chadamla entered the church and asked the pastor where the story he had told came from. 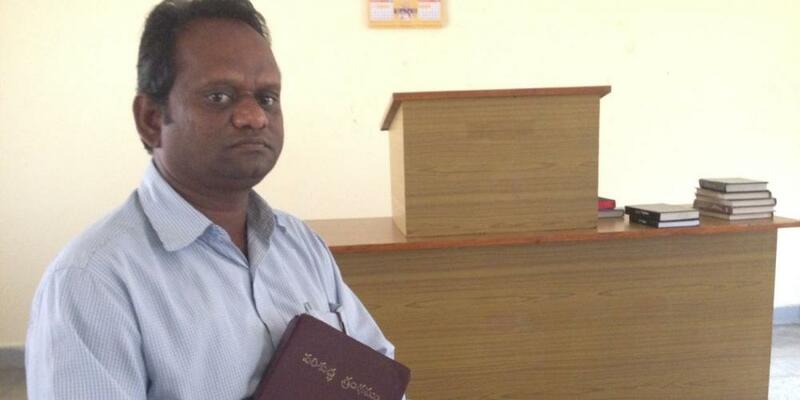 The pastor gave him a copy of the adult Sabbath School lesson quarterly and a Bible. Chadamla thanked the pastor and started home. That afternoon Chadamla thought about what he had heard in the church. He thought about how he had become such a cruel husband. The beatings began about three months after Chadamla, who was 22 years old at the time, married his 18-year-old wife. Both he and his wife had deep roots in their traditional religion. Chadamla was named in honor of the god of the wind. His wife was named after a traditional goddess. Even before they were married, Chadamla’s wife had known that she had been chosen by the spirits. She would become possessed by spirits during religious rituals, losing control of her body, dancing, and tearing her clothing. Villagers invited her to attend spirit meetings in their homes. When she was in a trance, they could seek advice from the spirits, and she would speak. Although he considered himself faithful to his religion, Chadamla strongly disliked his wife’s participation in the spirit meetings. He was particularly disturbed by how each spirit meeting ended; his wife would leave the home where the ritual had been held and dance wildly in the street on the way to the nearest shrine, where she would sacrifice a rooster or small goat. The sacrifice would leave her face and clothing splattered with blood. Shortly after the sacrifice, she would come to her senses and return home. “I didn’t like those rituals,” Chadamla said. He felt bad after each beating, but he couldn’t stop himself. Only later did he realize that the same evil spirits that possessed his wife were manifesting themselves in his actions as well. “I did not know that it was the devil’s spirit that was provoking me to beat my wife,” he said. Sometimes she fled to her parents’ house until Chadamla had calmed down. But she always returned, and she continued attending the rituals. Twice she suffered miscarriages during the rituals. That’s when Chadamla walked by the Adventist church near his home. He heard the pastor’s comments about Jacob and wanted to know more. Chadamla had no idea how much that meeting would change his life. Part of this quarter’s Thirteenth Sabbath Offering will help finish building a training and conference center about 20 miles [30 kilometers] from Chadamla’s home in central India. This will be the first major training and conference center in the entire Southern Asia Division. It will be available for use by local church members such as Chadamla, and pastors and lay workers from around the division. Please remember this project and the Adventist work in central India in your prayers and with your Sabbath School mission offerings.